‘Ondersteboven’ is composed of ‘onderste’ and ‘boven’ and is short for ‘het onderste boven’: the bottom(most) part up. It’s also common to say that something ‘is/ligt op zijn kop’ (head/top down). A common expression that I’d like to highlight is: ‘ergens ondersteboven van zijn’: to be very upset about something. The opposite ‘ik ben er niet (echt) ondersteboven van’ however, is used to say that you are ‘not at all that impressed’. See the Examples below. (“After the collision both cars were upside down in the bordering ditch; fortunately everybody came out unharmed.” Lit. : “…both cars were lying upside down… everybody appeared unharmed.” The verb ‘to appear’ can be translated as ‘verschijnen’ (to appear in general) or ‘tevoorschijn komen’ (to appear after having been obstructed from view).). – Binnenstebuiten: inside out, wrong side out [adverb]. – Achterstevoren: backwards, back-to-front [adverb]. – Op zijn kop: upside down (lit. ‘head down’) [adverbial adjunct]. Often used the same way as ‘ondersteboven’. – Aangeslagen: affected, shaken [adjective]. – Onder: below, at the bottom, underneath, downstairs [adverb]. – Onderst: bottom(most) [adjective]. 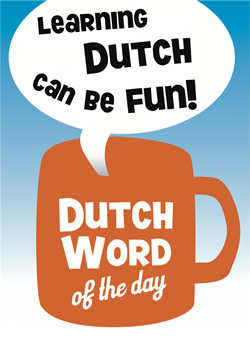 Typically only used with definite articles ‘de’ or ‘het’, e.g. ‘de onderste plank’, ‘het onderste vel’. – Onderste: the bottommost part [noun] [het onderste, <no plural>]. – Boven: above, up, at the top, upstairs [adverb]. This entry was posted in Dutch word of the day, DWOTD 1.0, Vocabulary Intermediate and tagged aangeslagen, achterstevoren, binnenstebuiten, boven, onder, onderste, ondersteboven, op zijn kop by Sander. Bookmark the permalink.